Life with Liv: Vtech InnoTab 3S review. 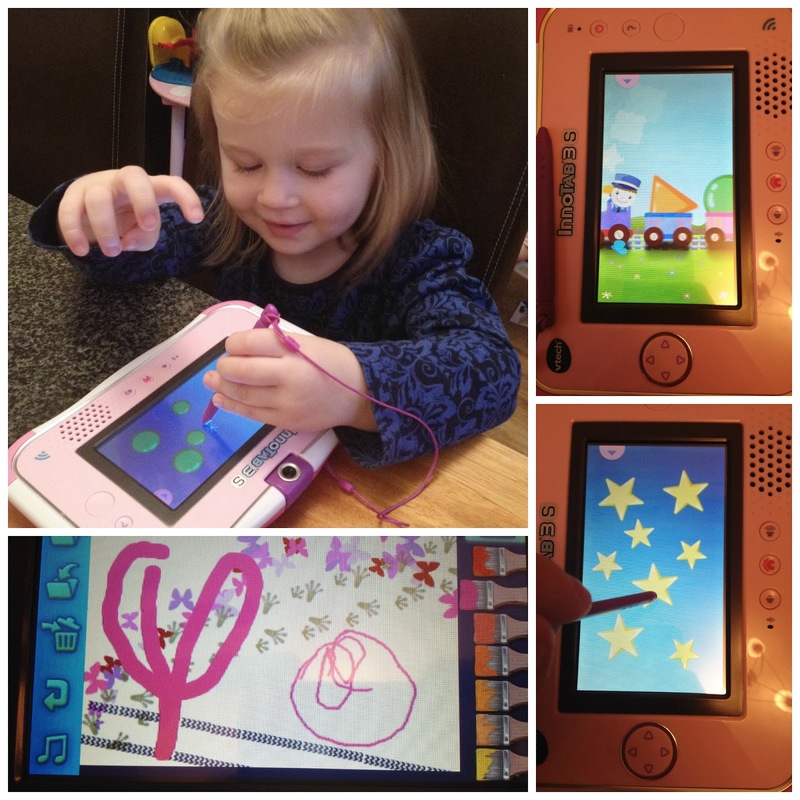 A few weeks ago Liv was a very lucky Girl to be offered the chance to review a Vtech InnoTab 3S. We pondered our response for around half a millisecond before replying with a great big YES PLEASE! We were not disappointed! Here is our review. Rechargeable battery pack and adaptor. Two stylus pens and a strap to attach a stylus to the console. The box recommends this for 3-9 year olds but Liv, aged 2, is easily able to play by herself. Setting up was nice and easy as with all Vtech items Liv has had. We just popped in the batteries and the cartridge and then powered up. I have read a few articles containing concerns about Children starting school unable to hold a pen or pencil correctly as they have become used to using their finger on touch screens too much, so I was really pleased to see the innoTab comes with a child friendly stylus pen, I attached the strap to the InnoTab and were good to go. You then have the option to take a photograph of the user and add their name, we chose to do this because it helps Liv recognise her written name. You then set the time and date and are asked to connect the Innotab to your computer using the USB cable provided. Once connected to The Learning Lodge on your computer it guides you step by step through set up. Once your tablet is set up and connected to Wi-Fi you are able to choose your free download. We chose Chugga Shapes as our free download, I thought it was going to be too simple when I looked at it properly but Liv loves it. The train drives across the screen with different shapes in the carts behind it, when a shape is chosen it leaves the cart, goes up in the sky and the name is written underneath. I then handed over to Little Miss who had been patiently sitting on my lap during set up. I showed Liv where to choose the App or draw a picture and the button with the house to take her back to the home page and straight away she was off to go drawing a masterpiece. She was amazed by the effects that were available and loves applying stickers or tyre tracks etc to her drawings. On top of the Tab there is a 180 degree camera/video camera allowing Children to easily take photographs and add in some funny effects. The only thing I would like to point out with this is if your Child is trying to take pictures of themselves they need to be in quite well lit area otherwise their face is not visible on the images, this does not appear to be a problem when the camera is forward facing. Older children are also able to send secure messages via an App to family or friends with an iPhone or Android phone, we have not set this up with Liv so she can't accidentally bother people all the time! We love the InnoTab 3S, it is fun, educational and robust enough for little ones. We give it a big thumbs up and would definitely recommend to Family and Friends. Why not check out the price of your little ones dream toys here at Argos? You might be pleasantly surprised. Disclaimer - we were sent this item in return for an honest review.